Want to live like the rich and famous, but with a price tag you can afford?? This is it!!! 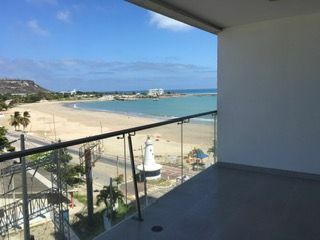 One of the newest buildings in Chipipe beach... the Punta Pacifico has a luxury result feel and incredible ocean views. Every feature in this building and in your condo is upscale. Step in to your new home and you will be struck by how much light there is. With wall to wall sliding glass doors in the living room leading on your your glass fronted ocean view balcony, you can feel like you are outside even when you are inside. The kitchen is one word...amazing! With granite counters and no shortage of storage space, it is a modern cook's dream. Take your gourmet dinners out to the spacious balcony and eat while watching the sunset and listening to the ocean waves. The master bedroom has its own private balcony with city views and views to the Mar Bravo and Chocolatera. The second and third bedroom both feature large windows letting in lots of light and giving you city and ocean views. The bathrooms are modern and have beautiful finishings. The Punta Pacifico building has two pools. The infinity pool in the front has ocean views, a large lounging area and a jacuzzi. The back pool is a shallow lounging pool with built in lounge chairs under the water! The back pool deck is peaceful and relaxing with beautiful landscaping and lots of seating...great for sunbathing! The building also has a game room with a pool table, sauna, steam room, and a very nice gym. All located mere steps from Chipipe Beach...the widest beach in Salinas.